Victoria is full of hotels, which indicates they city’s popularity as a beautiful vacation destination. 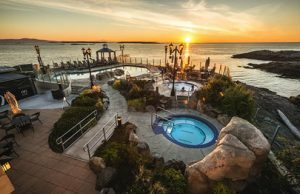 Besides the notorious Fairmont Empress on the harbour front, Victoria has options that encompass many other areas of the city. Able to accommodate any type of travel, whether it be business, holiday or a family vacation, one of Victoria’s many hotels will fit the bill. For a combination of luxury, comfort and a stunning view, a 4-star hotel or resort is a great option. Many of Victoria’s best hotels come with fantastic facilities like gyms and pools, and some even have their own spas ready to go with a number of relaxing treatments. 4-star hotels are a great way to treat yourself during your vacation and take advantage of the most comfortable places to stay, with the best views, whether its ocean or city, in Victoria. 3-star hotels in Victoria still offer that same, 5-star view and hospitality, just without the extra bells and whistles. For families, and the sake of affordability, it’s a great way to go. Not to mention, Victoria’s 3-star hotels are just as accommodating, and still within the heart of the action. 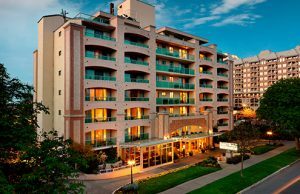 Nestled on the shores of the Pacific Ocean near Victoria, BC – The Oak Bay Beach Hotel is a luxury boutique property like no other. Our property overlooks the Juan de Fuca Strait and offers breathtaking ocean views of snow-capped Mount Baker in the distance. Just minutes away from the quaint boutique shops, cafes and art galleries of Oak Bay Village; the hotel is a worthy legacy to its renowned predecessor and features world-class spa services, heated seaside mineral baths and locally inspired dining in either the ionic Snug Pub or the intimate Dining Room. Your stay in one of our well-appointed Guest Rooms or Suites includes complimentary parking, WiFi, as well as nightly turn-down service. Let us provide the perfect vantage point from which to experience the best of the Pacific Northwest. Our downtown hotel in Victoria features deluxe guest studios, spacious premium one bedroom suites and luxurious penthouse apartments. Our fabulous location and award-winning staff, make this hotel a great place to stay when visiting Vancouver Island. Our hotel is 100% non-smoking and each room offers the added conveniences of a fridge, microwave, DVD player, HD television & private balcony. Our beautifully appointed and well equipped kitchen studios are ideal for longer stays. We are one of the few Victoria hotels that offer extended stay accommodations. We offer a delicious & complimentary full breakfast buffet for our guests, and various recreational amenities, including an indoor whirlpool, steam room and dry sauna, a seasonal heated outdoor pool, and a 24-hour fitness studio.